The wagons on the photos used in this explanation are equiped with hooks from etch 2006 and coupling etch 2003. 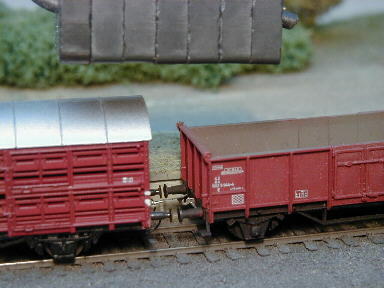 Both come along with 10 parts on the etch, enough to convert 5 wagons. For clarity the parts on the photo have not been treated with chemical blackening agent. 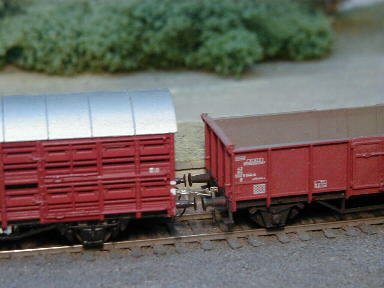 First photo shows how the blank coupling looks on a fiNe-scale wagon. 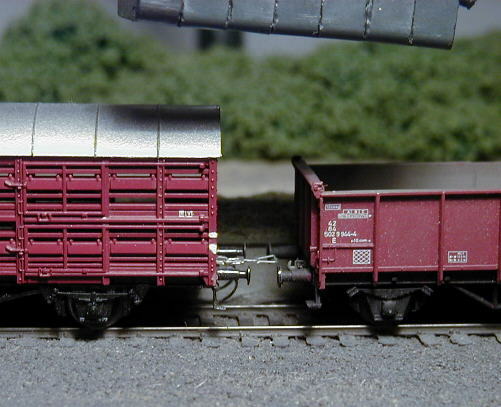 In this case a grocery van of the dutch state railways with extra goodies in the form of a brake platform, hoses and lots of other details that normally are forgotten by the r-t-r manufacturers. The longitidunal hole which is used for fitting in the hook. The other side is a triangular loop. The wider side is used to catch the hook and comes in two sizes. This is the widest etch nr. 2003 measuring 1.3 mm inside, etch nr. 2006 measures 0.9 mm. 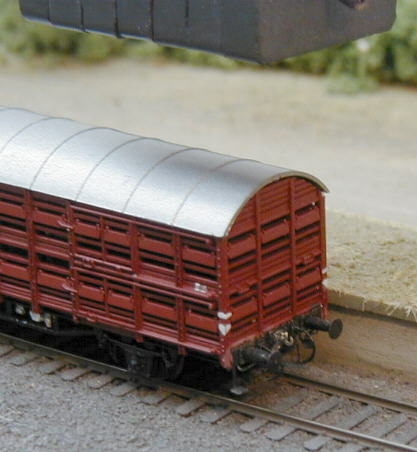 Note that the catching of the hook becomes more difficult on a smaller radius or with larger overhang of the wagon. 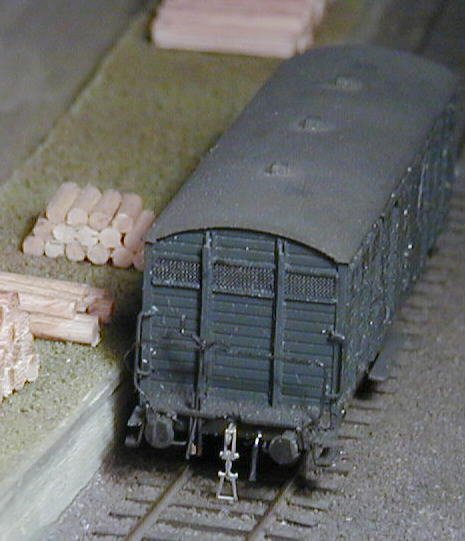 The 0.9 mm is thought for short wagons on prototypical radius of 190 m (1.2 m) or larger. 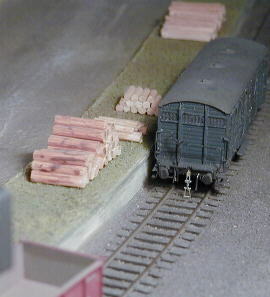 The wagons are standing on Bovigny, a Fremo module depicting a wood loading dock, halfway on the line connecting Luik and Gouvy in Belgium, . The cruel enlargement even shows the tiniest dust particles. Track is code 40 from Micro Engineering, USA. The difference is caused by the position of the magnet in relation to the coupling. 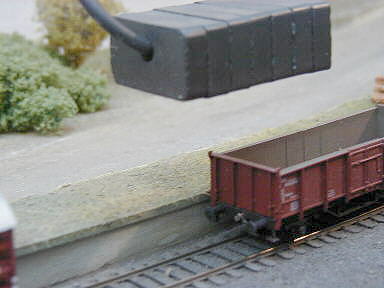 In this case the magnet is above the wagon, in the raised position the magnet is moved further out over the front of the wagon to about halfway. 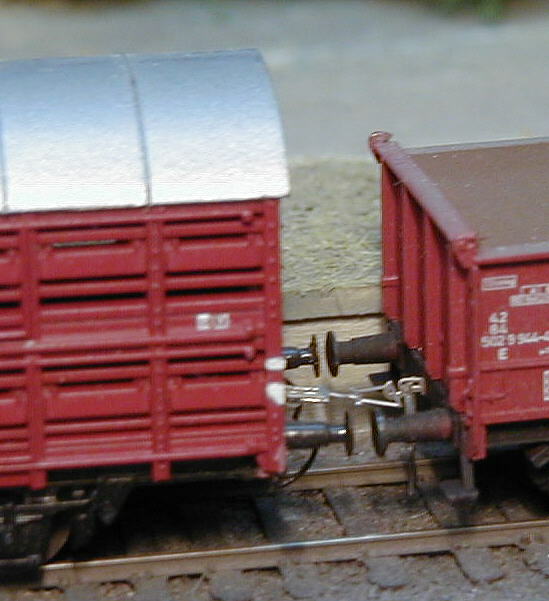 For coupling 2 wagons practise shows that it couples easiest as the standing wagon has his coupling underslung and the moving wagon has his coupling raised. But with a little more experience the other way round is feasible too. The whole procedure is sketched with the following series of photos. 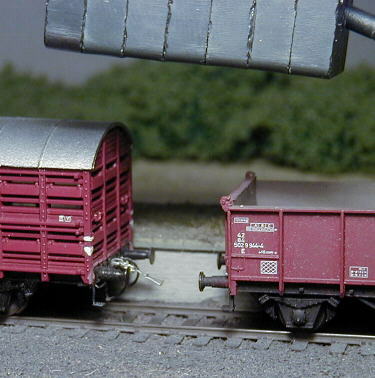 Here we see how we position the magnet above an open wagon. The magnet is about halfway over the coupling and the coupling is repelled and in underslung position. We keep the magnet in this position and then move the cattle wagon toward the open wagon. Notice that everything is magnified about 10 times the real dimensions. 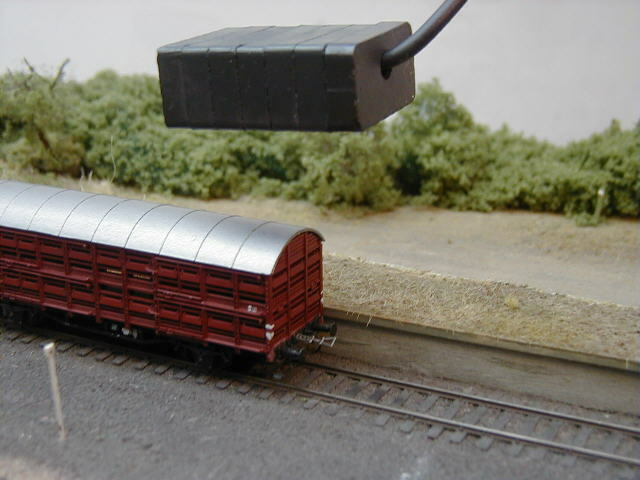 When we propel the cattle wagon under the magnet the coupling starts to raise, when the buffers are about 3 mm apart the coupling reaches the height of the hook. This photo clearly shows the hook hovering above the hook. When we now raise the magnet the coupling will drop into the hook. 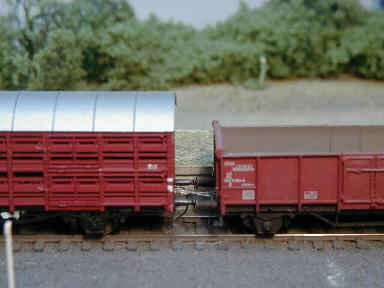 Here we are coupled up and can either move out or go on pushing two wagons coupled as shown in the next photo. 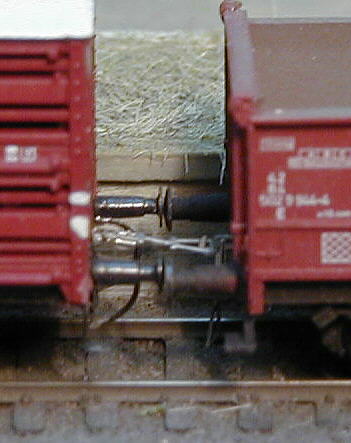 Note that only 1 coupling of a pair is used, the one on the open wagon is hanging down. 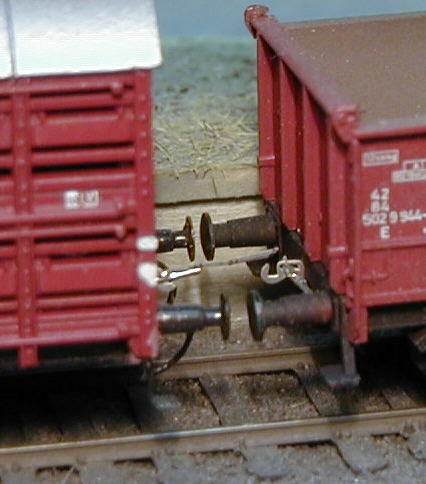 Smarties might think that they only need 1 coupling per wagon but note that screwcoupling part is bearing in the hook thus you need at least 2 hooks on either side and therefore might fit the other screwcoupling as well. The buffers are touching as the pushing is over the buffers. The coupling is not strained and moved backwards in its elongated hole. The small indent in the hook prevents the coupling from working its way toward the top and falling out. The coupling is matched for the use with standard continental buffers of 4 mm length. copyright coupling design by Jens Emmermann & Schiffer Design, 1999.